I kid about the tribute to AMH (Anna Maria Horner) part....sort of...maybe. Ok, I'm not kidding. I really love her fabrics! Anyway, I am so excited to share this room with you finally! I love this room (and AMH)! One of the biggest reasons for moving this past year was because we really needed a guest room for my mom to stay the night for when she babysits and for family visiting. My in-laws live over 9 hours away and when they come to visit they usually stay for a week at a time. Before kiddos, it was easy to accommodate them, but after little relish was born, we ran out of rooms and we would usually put little relish in a pack-in-play in the play/sewing room. We knew this set-up wouldn't last forever. At the new house, we decided to make what was suppose to be the office located off the garage and laundry room into the guest room and made the 1/2 bath into a full bath with a shower. So now when we have company, they have a nice little private area downstairs to stay! 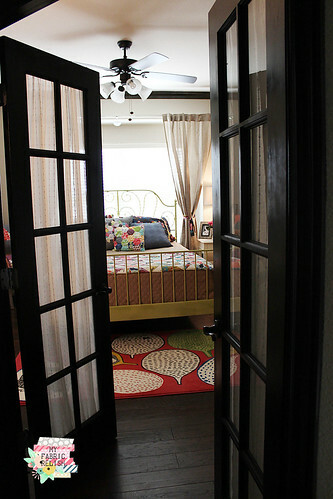 The room included french doors and I decided that I wanted to keep them like that and just add curtains. I figured that at some point, we might want to make the space an office. I bought some semi-sheer curtains from ikea and trimmed up the top and bottom to fit the cafe rods that Mr. Relish attached to the doors for me. It was easier than I expected! 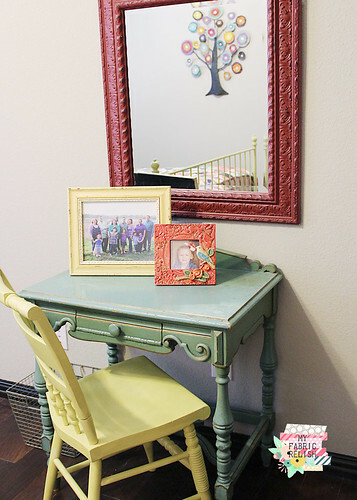 I originally bought this antique dresser for big relish, but the third drawer was hard to open and knew it wouldn't work for a little girl to get in and out of. I'm actually glad that it didn't work out because I think it looks great in here! I found the lamp and the bird picture above at TJMaxx Home Goods. 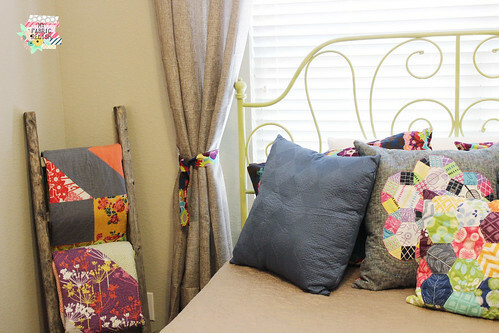 Notice my Quilty magazine quilt on the bed? 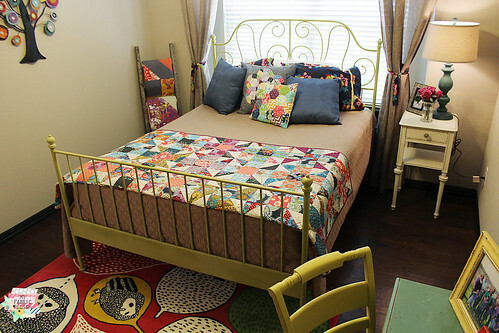 When I designed this quilt over a year ago to submit to Quilty, I knew it was going to go on a guest bed one day. I decided to spray paint my $99 Ikea bed frame from white to a chartreuse. I figured if I didn't like it, I could always paint it black. It sucked painting it in the heat of summer so I think I keep it that way for now. The night stand is another antique and I found the lamp at TJMaxx Home Goods. Rug is Ikea. I originally planned to make curtains from my all time favorite Anna Maria Horner print from Hand Drawn Garden (Centerpiece midnight) but thought since I wanted to make the bed colorful and busy and make the curtains subtle. I found these pretty cheap at Hobby Lobby for 50 percent off (I think I spent $15 on both)! So, I made pillow cases and curtain ties instead! I found this desk years ago at a consignment shop and the chair at a thrift store. I spray painted it to spruce it up and then the mirror is from Hobby Lobby and so is the fun metal tree in the reflection. It makes a great spot for sitting to put on makeup or work on the laptop. I love my little ladder that I found on Amazon (affiliate link) and it was suppose to be in the family room but little relish assumed it was totally for her and decided it was to climb. Silly mommy for that one! So it's now in the guest room holding quilts in case my guests gets cold. I love it much more in here, anyway! Well, that is the guest room! I am looking forward to my special guest, Alyce from Blossom Heart Quilts, next month and hope she loves her digs for her visit! If you want to see other rooms that I have revealed, you can check them out here --> formal living/dining and sewing room. Your guest room is perfect! 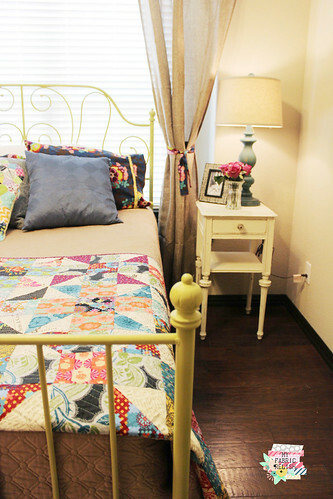 It looks so cozy and the quilt ties the whole room together so nicely! what a great room, I have been eyeing that bed frame from IKEA for my spare bed too!! 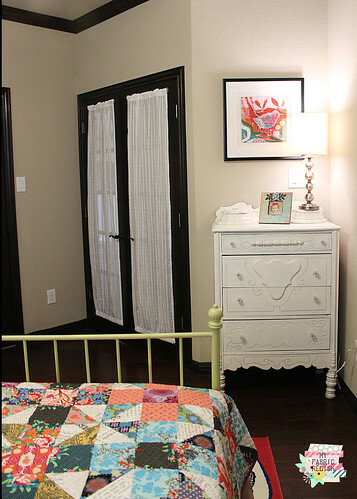 I love the idea of the little quilt ladder in the spare room, I hope you don't mind if I borrow that idea too!! My husband & I will be moving soon and I will be decorating a guest room. You have so many great ideas! Thanks for letting us know where you purchased your furniture and accessories. 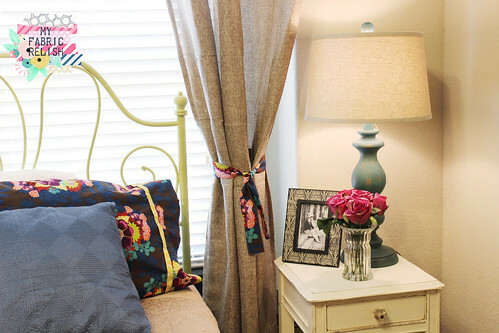 Your guest room looks great! Beautiful Melissa! I love the dark french doors, and as always, your style is so "YOU!". I have an old metal IKEA bed I've been saving for 10 years, and maybe I should spray paint it too:) P.S. Love the all the cool furniture! So gorgeous! I've sorta of given up on having a presentable house with my young children. Yours looks so NICE and cozy. Fantastic job! It's so beautiful!!! What an amazing job! !